Master Smith was born in Aurora, Illinois in October of 1954. He started his martial arts training in Isshinryu in 1972 under Sensei Patrick Buckley. Sensei Buckley, a student of the late James Chapman, promoted Master Smith to the ranks of Sho-Dan and Ni-Dan. After Buckley's School of Isshinryu closed, he made inquiries to several Isshinryu organizations and after reviewing his options followed Sensei Buckley's advice and chose to follow Grand Master Armstrong and the A.O.K.A. Master Smith opened his school in 1975 under the name Eastwood Karate Club; the school name was subsequently changed to the Midwest School of Isshinryu. Master Smith has been a volunteer instructor since his schools inception. In the late 70's Master Smith's efforts to encourage area Isshinryu schools to use the tapes of Grand Master Shimabuku to help standardize the kata's met with great resistance. Master Smith regularly corresponded with Grandmaster Armstrong whose conversations helped keep his spirit alive. Master Smith met his current instructor, Grandmaster Steve Young through a co-worker, also a student of Isshinryu, who, while at work, repeatedly returned requesting to be taught new segments of the kata he was learning at his school. The student continually returned for further instruction. This surprised Master Smith because at that time very few instructors in the area preformed Isshinryu kata so closely to the films. Finally, Master Smith went to meet the co-workers instructor and was introduced to Master Steve Young. Master Smith has been a student of Master Young's ever since. Master Smith has continued his training over the years participating in seminars taught by Grand Master Steve Armstrong, Grand Master Louis Lizotte, Master Ron Boucher, Master Sherman Harrell, Master Nick Adler, Master Angi Uezu, Master Kichiro Shimabuku, Master Willie Adams, Master A. J. Advincula and Grandmaster Stephen Young. Master Smith received his 9th Dan in Isshin-Ryu Karate in November of 2013. In November of 2011 he received his "Kyoshi" certificate from Grandmaster Steve Young. He has also served on the A.O.K.A. Awards Committee and is currently on the A.O.K.A. Promotion Board and Advisory Board. 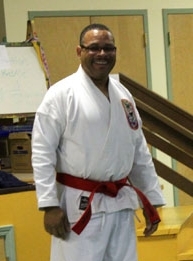 Master Smith has received a number of local and national awards for his participation in and support of martial arts, and specifically, Isshin-Ryu Karate. In July of 2017 Grandmaster Smith was inducted into the Isshinryu Hall of Fame. Master Young was born in Carthage, Illinois on January, 10, 1955. He started his martial arts training in both Isshinryu and Shotokan in 1971. Master Young progressed to the rank of Sho-Dan in both arts and gradually moved full training efforts into Isshinryu. During the next 12 years, Master Young was very active in the tournament scene. He also was very active in assisting in the dojo. Under the instruction of Sensei Jerry Tuzzo, Master Young open his first dojo in Carthage. Upon graduation from college, Master Young moved to the Chicago area. At this point he was encouraged to contact Grand Master Stephen Armstrong to seek advice on continued training. Grand Master Armstrong invited Master Young to his Tacoma dojo. Each year Master Young would travel to Tacoma, or arrange for Grand Master Armstrong to come to the Chicago area, to continue his training. Through Grand Master Armstrong's introductions, Master Young met Grand Master Lewis Lizotte and Grand Master Willie Adams. These masters, became Master Young's source for continued training and guidance. Master Young now trains under Grand Master Lizotte. Master Young opened several dojos in the Chicago area during the late 1970's and continued through the mid 1990's. Master Young's schools became a major faction of the American Okinawan Karate Association. During this era, Master Young hosted two of the AOKA Grand Nationals. Heavy job related travel has forced many of the schools to close. The main dojo is located in Aurora with one of Master Young's long -time students, Master Keith Smith, in-charge of the school. Master Young is currently an 10th Dan in Isshin-Ryu Karate, a 1st Dan in Shotokan and a Brown Belt in Judo. He has served on the Board of Directors of the American Okinawan Karate Association and has since been appointed as President of the Association. Master Young has received a number of local and national awards for his support of martial arts, and specifically, the support of Isshin-Ryu Karate. He was awarded the "Spirit of Isshin-Ryu" by the AOKA Isshin-Ryu Hall of Fame. Master Young is a Certified Public Accountant and holds an undergraduate degree in accounting. He also holds an MBA in Finance and has spent a large portion of his career in the auditing profession. Master Young currently serves as Vice President of a joint venture based in Sao Paulo, Brazil. Master Young currently resides in Wheaton, Illinois where is married and has two children, Jennifer and Joseph. Jennifer is a Junior at Florida State University majoring in Marine Biology. Joseph is a Junior at Wheaton Warrenville South High School and is an avid football player. Jennifer, Joseph and his wife, Kay, are all Black belts. On July 12th, 2003 Grandmaster Lewis Lizotte promoted Steve Young to the rank of Grandmaster, 9th degree blackbelt. Mrs. Strunk started karate in 2007 under the instruction of Master Keith Smith. Severely overweight, she had spent three traumatic days in the hospital, where she had to use special extra-large blood pressure cuffs, special extra-large wheel chairs, and the special extra-large MRI machine. When she was released with a relatively clean bill of health (except a diagnosis of asthma), she vowed to change her lifestyle and started by joining her daughters in taking karate classes at MSOI-Aurora. Four years later and 100 pounds lighter, she has participated in dozens of karate tournaments across the country, dragging her children and best friend in tow. Now an assistant instructor, Mrs. Strunk has a fitness-oriented and commpetition-centered approach to teaching. She is also an active blogger who writes about competition, weight loss and body image in her blog, The Fat Karate-ka. When not at the dojo, Mrs. Strunk practices mixed martial arts and is also an avid CrossFitter, paleo enthusiast, anime fan and cosplayer. Mark Bettenhausen has been studying Isshinryu Karate since 2011, under the instruction of Master Keith Smith. After many years of being shy and timid, Mark decided to seek out a way to gain self-confidence. After just a few beginning classes, he knew this was the right path. He also has a strong interest in the self-defense aspect of karate. Mark is an art director in the advertising/marketing industry. His ability to present his ideas and creations has blossomed since joining MSOI-Aurora. Outside of work and the dojo, he enjoys fishing, camping and family time. Mark earned his Blackbelt in August of 2017.